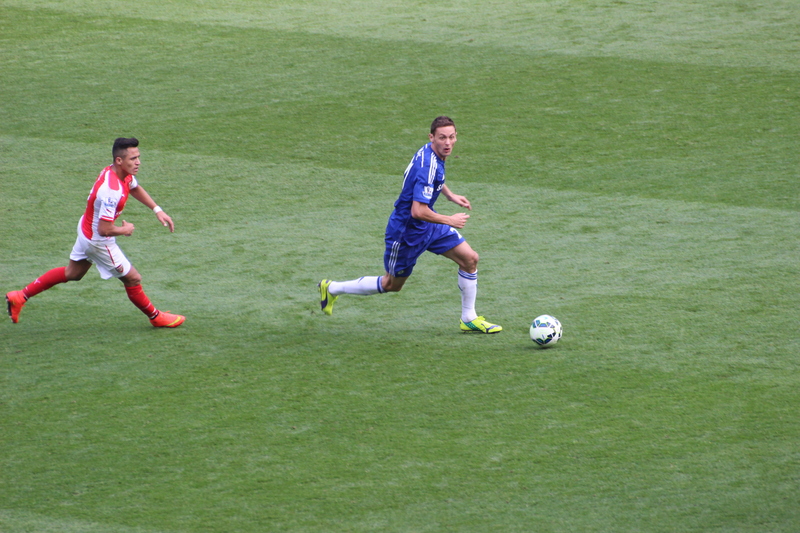 Chelsea vs. Arsenal : 5 October 2014. After an enjoyable European Away, there often seems to be a sense of anti-climax leading up to the next game. In London parlance this is often termed “after the Lord Mayor’s Show.” Not so on this occasion. A home derby against our oldest London rivals Arsenal, with memories still fresh in our minds of the 6-0 drubbing we gave them last spring, was enough to get the pulses racing. I travelled up to West London with Lord Parky and Bournemouth Steve. Before the match, I needed to do some scurrying around to meet up with a few transatlantic supporters in a couple of pubs. For once, I would not make it to my usual base camp, The Goose. Parky joined me for a quick pint with some good friends from Southern California – some of the infamous OC Hooligans – at the Prince of Wales at West Brompton. John, Tom, Matt and Phil are “hooligans” in name only; they are some of the nicest bunch of supporters that the US has to offer. It’s always a pleasure to meet up with them. I collected a spare ticket and bade them a fond farewell. I then needed to head off down to the stadium, and my route took me past three pubs which we have frequented in the past; “The Atlas”, “The Harwood” and “The Lazy Fox” aka “The Fulham Dray.” I made a bee-line for “The Butcher’s Hook” and pushed through the crowded front bar. Towards the rear of the pub, I met up with Leigh-Anne from Toronto, her boyfriend John and his brother Kevin. I had briefly met Leigh-Anne and John in NYC in 2012. I was able to assist in getting tickets for two of the three, while another of their acquaintances procured the third. They were suitably buzzing. Leigh-Anne and John had been in Barcelona during the week, and Kevin had been visiting a mate from Croatia in Milan. We live in a golden age of travel for sure. We’re lucky buggers. It was lovely to be back in “The Butcher’s Hook” before a game. In addition to being the very location where our club was formed in 1905 – in the room above – it also brought back a lovely memory from 2004-2005. For our game against Birmingham City, my friend Glenn and I attended the match with two very special people; his grandmother and my mother. Before the match, we had enjoyed a lovely pre-match meal in “The Butcher’s Hook” and I was reminded of that very special day. It was wonderful that my mother, aged 75, was able to see Chelsea play in person during our first championship campaign in fifty years. We had all met Peter Osgood in the megastore too. It was a cracking day out. I guzzled down another pint amidst rapid-fire conversation with the three Canadians about all things Chelsea. Before we knew it, kick-off was approaching fast. I warned Leigh-Anne, John and Kevin to finish off their drinks. It would be a shame to miss the start. Outside the weather was splendid; the gentle autumn sun meant that most were in shirt-sleeves. At the turnstiles for the MHU, there was a large queue to enter. While we were in line, the stadium PA announced that due to “an incident” the game would be delayed for fifteen minutes. What luck for the three Canadians. I sent them a text; there was no need to rush. There were a few rumours about flares being let off outside, but nobody was sure. So, possibly our first and only 2.20pm kick-off. Stamford Bridge looked a picture. For some reason, I was reminded of the famous oil painting by Charles Cundall of the stadium for the Chelsea vs. Arsenal Division One match in 1935, a game which happened to host our largest ever “official” attendance of 82,905. The club constructed a special platform for the artist above the vast terracing above the north-west corner flag and the panorama depicted – or at least the view and the angle of the pitch – was quite similar to my particular view in 2014. I have waxed lyrical about the charms of the old ellipsoid Stamford Bridge in the past. For all of its idiosyncratic awkwardness, with odd stands and crazy angles, I still miss it badly. The current Stamford Bridge, housing almost exactly half of the 82,905 of 1935, is obviously a fine stadium. There is something quite Chelseaesque about its four misaligned stands. Chelsea has never been about conformance. There had always been an edgy dimension to us, even our stadium. It has warmed me immensely to hear that the board of Chelsea Football Club, in addition to testing the waters of the local populace, businesses and council of Hammersmith & Fulham with regard to possible expansion of Stamford Bridge, have allegedly contacted the RFU with a tentative request to use Twickenham while The Bridge undergoes possible improvement. This is very pleasing to hear. Stamford Bridge is our spiritual home; it makes us who we are in my honest opinion. It defines us. I am heartened that the board has acknowledged this. I wish them every success in redeveloping Stamford Bridge. Let the unpleasantness of the “CPO Autumn” of 2011 be a distant memory. Who knows, maybe those plans for a 60,000 Stamford Bridge, first mooted by a smiling Brian Mears in 1972, might eventually come to fruition. And, intriguingly, maybe that 82,905 attendance record might just be eclipsed at the home of rugby union. Twickenham currently holds 82,000. Interesting times ahead, let’s hope. At last the teams appeared. The nine “league ever-presents” were supplemented by Schurrle and Oscar. Arsenal, wearing a very light red, chose to attack the Matthew Harding and for a few seconds, my mind played tricks on me. It seemed like it was the second-half already. Arsenal were supported by three thousand away fans and, although I am unsure, I thought I heard chants from them suggesting that Cesc Fabregas should go away and fornicate. No doubt about it, Arsenal dominated the first quarter of the game. They looked steady and composed in possession, while we struggled to put more than three passes together. We looked edgy and nervous. After a quarter of an hour, however, there were no shots on goal from either side. The memory of last season’s rout was suddenly fading. Arsenal looked a lot more at ease. The first real chance fell to Alexis Sanchez, but a brave Courtois block quelled any danger. Arsenal maintained the advantage. Then, slightly delayed, Courtois fell and sought medical attention. The Chelsea medical team attended our young keeper, while Chelsea fans in Nerdistan fell in love with Eva Carneiro all over again. After a few minutes of concern, Courtois was replaced by Petr Cech. He received a magnificent reception. I took a “comfort break” just as the heated exchange between the two managers took place on the touchline. I’m sure everyone enjoyed that, though. …er, the pitchside scuffle, rather than the thought of me turning my bike ‘round. On twenty six minutes, Eden Hazard set off on a mazy run which Alberto Tomba would have been proud. He slalomed his way into the box and a wild stab by Laurent Koscielny sent him tumbling. It was an obvious penalty. Eden Hazard took his time and stroked the ball past Wojzciecjzh Szczszcesesncy. I’ll be honest, the goal was slightly against the run of play, but we cared not. The Bridge roared with approval. Jack Wilshere tested Petr Cech with a run on goal but lost control just as our ‘keeper raced out to smother the ball. There had been few clear chances in the first forty-five minutes. We were obviously content with a lead, but hoped for more Chelsea chances after the break. Just after the break, Cazorla drilled a low shot just past Cech’s left post. I momentarily held me head in my hands. Chances were still at a premium. On the hour, Eden Hazard advanced and sent a low cross towards goal, only for Flamini to stab at it and deflect it on to the near post. Chelsea continued to close down space, pester the Arsenal player on the ball, and stifle their passing game. There was special praise for Oscar, not always the flavour of the month, who put in a tireless display. His relentless running, tackling – “nibbling” – and blocking set the tone for the rest of the team. As the last quarter approached, the manager replaced Schurrle – again, off the pace – with the steadying influence of Jon Obi Mikel. Next, Diego Costa set off on an invigorating run which resulted in a crisp pass to Hazard, who had supported the marauding centre-forward, but whose shot flew over the bar. For all of Arsenal’s possession, they very rarely tested Cech. The atmosphere was not brilliant, though there were times when the home faithful did their job. The “ole, ole, ole, ole” and the “Jose Mourinho” chants seemed to galvanise the support. With just over ten minutes remaining, Fabregas took control in the middle of the pitch and lofted a high ball over the sleeping Arsenal backline. Who else but Diego Costa darted free and just…just!…reached the ball before the Arsenal ‘keeper could clear. He chested it down and in one movement delicately lofted it over the beaten Szsczszceseszsncy. Stamford Bridge went into orbit. I snapped away as he jumped and screamed in pleasure down in Parkyville. I hope that the North Americans were able to snap a few too. It was Diego’s ninth goal in seven league games. And it was game over. Ah, the absolute joy of being able to sing “One Team In London” without fear of being incorrect. There was even disbelief and then sudden merriment as Diego da Silva Costa blazed over from six yards after a fine move down the right; the linesman thankfully, in the circumstances, ruled him offside. At the end of the game, I met outside the Peter Osgood statue in order to sort out yet more tickets for other friends. By doing so, I had unwittingly missed a few scuffles down at Fulham Broadway which had resulted in a few punches being thrown between a few Arsenal and Chelsea followers. This entry was posted in Season 2014-2015 and tagged 2014-2015, Arsenal, Cesc Fabregas, CPO, Parents, Pubs, Stamford Bridge by Chris Axon. Bookmark the permalink.